Grafton National Cemetery is located in Grafton, West Virginia, near the banks of the Tygart Valley River, approximately 25 miles south of Morgantown. The cemetery contains burials of United States veterans of every conflict from the Civil War to Vietnam. The steep slope of the terrain requires terraced grounds, giving the cemetery one of the most distinctive landscapes of any Civil War-era national cemetery. The national cemetery opened in 1868 in order to provide a burial ground for Union soldiers who died in West Virginia’s military hospitals and battlefields. The Federal Government selected Grafton as the site of the national cemetery for its proximity to the Maple Avenue Cemetery, which already contained the remains of many Civil War veterans. On June 14, the first governor of West Virginia, Arthur Boreman, officially dedicated the cemetery. The cemetery contains more than 2,100 interments, including 1,252 Union soldiers. 613 Civil War soldiers are buried as unknowns and their graves are identified with six-inch square marble markers. The earliest burials came from Clarksburg, Wheeling, and Rich Mountain, and sites in Fayette, Marion, Kanawha, and Grant Counties, as well as eastern Kentucky. They are interred in the lowest two terraces. The dead buried at Grafton National Cemetery—now closed to new interments—represent more than 30 West Virginia counties and 24 states. The three-acre site is roughly square, and consists of three terraces descending from the main entrance along Walnut Street. A central walkway and staircase leads from the entrance, running the length of the cemetery, dividing the grounds in half. At the middle of the cemetery, along the central axis between Sections C and D, is the flagpole. A three-foot tall stone wall encloses the entire grounds. At the southwest corner of the cemetery is the superintendent’s lodge. The 1½-story stone building topped with a gabled roof was completed in 1900, replacing the original lodge designed by Quartermaster General Montgomery C. Meigs. The Meigs lodge remained onsite until 1957. Photograph courtesy of the National Cemetery Administration History Program. Perhaps the most famous veteran buried in the cemetery is Private Thornesberry Bailey Brown, believed to be the first Union casualty of the Civil War. Brown mustered into service in Company B, 2nd Virginia Infantry, and served under Captain George R. Latham as part of the “Grafton Guards.” On May 22, 1861, near present-day Grafton, a Confederate sentry ordered Brown to halt. Brown refused and shot the sentry in the ear. The sentry returned fire, shooting Brown in the heart. In June 1903, Brown was reinterred in Grafton National Cemetery from a private plot, and the following year, the Grand Army of the Republic erected a marble obelisk marking his final resting place at Section F, Grave 1266. Memorial Day services at Grafton National Cemetery include a special tradition known locally as “Flower Strewing Day.” Historically, each year a parade begins in downtown Grafton and winds its way towards the cemetery, where children from the town place flowers at each grave marker. The day concludes with a memorial service officiated by a prominent West Virginian. Every governor, except one who served a term of only six days, has spoken at the Grafton National Cemetery at least once during their term in office. 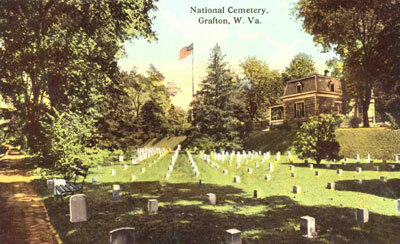 In 1938, the United States Post Office issued a stamp featuring an image of the Grafton National Cemetery. 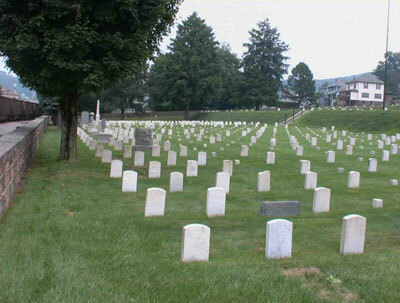 In 1987, the West Virginia National Cemetery opened in Pruntytown, just five miles west of Grafton, to accommodate the burial needs in the decades to come for the state’s veterans and their families. Grafton National Cemetery is located at 431 Walnut St., in Grafton, VA. The cemetery is open for visitation daily from dawn to dusk. No cemetery staff is present onsite. The administrative office is located at the West Virginia National Cemetery, and the office is open Monday to Friday from 8:00am to 4:30pm; it is closed on all Federal holidays except for Memorial Day and Veterans Day. For more information, please contact the cemetery office at 304-265-2044, or see the Department of Veterans Affairs website. While visiting, please be mindful that our national cemeteries are hallowed ground. Be respectful to all of our nation’s fallen soldiers and their families. Additional cemetery policies may be posted onsite. Grafton National Cemetery was photographed to the standards established by the National Park Service’s Historic American Landscapes Survey.